it was a long time ago, but wasn’t the ap one of the major news organizations loudly beating the drums for war with Iraq? So whom does the NSA work for? “I don’t think it’s so much a failure to connect or share information this time. I think it’s a problem of having too much information,” Coleen Rowley, a former FBI special agent and legal counsel in Minneapolis who blew the whistle on intelligence failures in lead-up to the 9/11 attacks, said. Rowley is now a critic of the mass collection of Americans’ data in the name of combating terrorism, saying such intelligence is not intelligent. “How can adding hay — non-relevant info — to the haystack help you find the needle?” Rowley asked. WES> “How can adding hay — non-relevant info — to the haystack help you find the needle?” Rowley asked. I would suggest that the “needle” is not what they are looking for. Each and every new event gives the Government exactly what it is always looking for–more power, more control, less freedom for the people. Why? Because, we can. It’s all technology for terminologies sake. More must be better right? 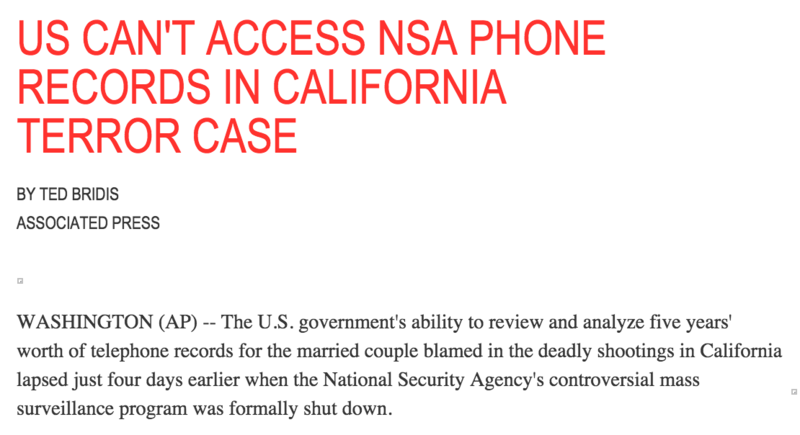 All phone companies keep the meta data for all calls and with a warrant the FBI can get that data for the couple and everyone they called. It has been like that forever. The phone companies keep the data because they use it later to engineer capacity needed in the networks and to created various pricing plans. Yesterday on Meet the Press I heard April Ryan saying that if they use rotary phones then the calls can’t be “seen”. That’s pure horseshit. I tweeted that to Ms Ryan and she claimed the FBI and CIA had told her that. I told her she was talking to someone who is ignorant of how the phone network works. Analog calls have always been tapable and the meta data is collected just like any digital call. All analog calls are digitized at the neighborhood boxes sitting on the sidewalks and have been for decades. So I wonder why the FBI, CIA is misleading a White House reporter like Ms Ryan? They don’t even need a warrant to get the phone calls from the phone companies. Just an administrative subpoena. No judge involved, no probable cause. Really no judge, no probable cause, all that needs to be done is fill in a couple of blanks on a form. Sometimes even that isn’t done, cops/prosecutors just ask and get. I haven’t seen a rotary phone in years. I wouldn’t know where to go to find one. Possibly Ms Ryan is thinking of some other country. some years ago “i” requested call records as part of a civil suit. there was no hassle at all. i also got my own phone records simply on personal request to telco. the records were sparse but useful. as i recall, number calling, number called, and precise time of call. all calls, whether answered or not, were listed. i don’t know what the time limits for retention are now with population increase, but then i believe it was at least two years. Thanks for this info, and I saw shout-outs to it in several blogs this morning. I heard this specious nonsense spouted out on National Propaganda Radio (which I had to keep turning off due the plethora of propaganda bullsh*t yesterday). I knew that Rubio was wrong wrong wrong – whether Rubio, himself, knew he was lying or is just a [email protected] is beyond my pay grade to figure out – when they reported this crap. If nothing else, it *may* have been “reported” in order to deflect attention & criticism from the kazillion$ of US tax dollar$ spent on all the Alphabets & their various spy-on-citizens-to-keep-us-“safe” programs. Really aggravating, but most citizens, esp the FoxCult members, will use this a take-away for: a) how Obama’s the terribulist worstest Muslim-supporter evah!! !111, and b) why we taxpayers must for MOAR spying on us. You can bank on that. It would appear that “AP” now stands for Appropriated Press. They’re reporting that there was a $28,500 deposit to Syed Farook’s bank account and subsequent disbursements to the gun purchaser friend and the mother. They haven’t figured whether the deposit was the result of a loan application or something else. These systems just don’t work in real-time to prevent an attack. Meanwhile, Syed Farook’s reported income appears to have stabilized at $53,000. He was first reported to be making $70,000 and then that figure fell to as low as $49,000. $28,500 would be quite a loan on his income.